The Franklin Model DIT-1 Digital Countdown Timer features a sleek oval design with easy to read liquid crystal display. User can select any time up to 99 minutes 59 seconds. Timer includes time-out, beeping alarm, and repeat cycle, magnetic mount. Reliable solid-state design. 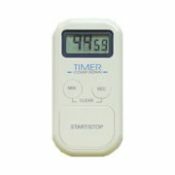 The DIT-1 Interval Timer is ideal for use in school laboratories, kitchen classrooms, darkrooms and for sports activities. Sleek, oval design lies flat for quick, easy operation. Minutes (M) and Seconds (S) markers flash during timing. Minutes and Seconds Buttons let you program the desired time value. Timer can be programmed up to 99 minutes. Start/Stop Button begins countdown, shuts off alarm, and activates memory function. Magnet conveniently attached to back of Timer for handy placement on metal surfaces.